Korean jjolmyeon are chewy wheat noodles served chilled in a spicy, sweet and sour sauce with vegetables. 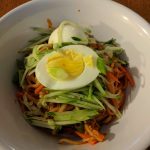 The word “jjolymyeon” literally translates to “chewy noodles” and refers to both the kind of noodles and this recipe. When you cook jjolymyeon they should be elastic and soft, but not tough or hard. Every brand of noodles is a bit different so I suggest you first cook the noodles for five minutes and take a sample to taste. If they’re soft and chewy with nothing hard inside, they’re well cooked. If not, cook them 1 or 2 minutes longer. You can find jjolmyeon sold in the frozen section of a Korean grocery store. There are 2 types of packages: a jjolmyeon set that includes the noodles and the sauce, and a package that just has the noodles. 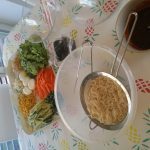 I prefer to buy the just the noodles and then make my own seasoning sauce at home, which is more delicious and cheaper. If you’re in a hurry you can get the set with the sauce, but I suggest that when you make jjolymyoen with the kit you dress it up with more seasonings and vegetables, as well as an egg and some toasted gim. And if you can’t find jjolmyeon noodles near you, you can replace them with any other noodles you have on hand, even spaghetti noodles! Jjolymyeon is a regular dish in Korean snack bar restaurants called bunsikjip (분식집) that also usually serve inexpensive dishes that students love like gimbap, tteokbokki, and ramyeon. I like jjolmyeon but when it comes to cold noodles my favorite is still bibim-naengmyeon, where the noodles are thinner and darker. 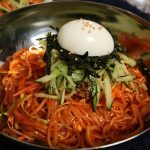 I also love kimchi-bibimguksu, where the noodles are not chewy at all and are mixed with kimchi and gochujang (hot pepper paste). But chewy jjolmyeon, mixed with the spicy sauce, soybean sprouts, vegetables, and toasted gim has such a unique refreshing flavor and texture that it’s unforgettable and has a special place on my menu. Combine seasoning sauce ingredients to a bowl and mix well. Pick out any rotten soybean sprouts, then rinse and drain a few times in cold water. Put the soybean sprouts in a pot and add 2 cups water with ½ teaspoon salt. Cover and boil for 12 minutes over medium heat. Put half of the sprouts in a large mixing bowl so they can cool down. What’s left in the pot will be served as a soup with the jjolmyeon, so keep it hot. Stir with a wooden spoon or tongs occasionally so that they don’t stick to each other. Cover and let cook for 5 minutes over medium high heat. Take a sample to see if the noodles are cooked properly. They should be chewy but soft. If they’re not soft enough, cook them for another 1 or 2 minutes. Strain and rinse the noodles in icy cold water. Rub the noodles with your hands in the cold water to remove any excess starch and to cool them down. Strain. Add shredded cabbage, shredded carrot, and the seasoning sauce to the bowl with soy bean sprouts. Mix it with the wooden spoon. Add the noodles, sesame oil, and sesame seeds. Gently mix it up by hand. You can add a few pieces of ice cubes to make them cold. You can wear a plastic glove, if you want. It will be cold! Divide into 2 portions and put them into 2 large shallow bowls. Add cucumber, shredded gim, and half an egg on top. Add salt and some chopped green onion to the soybean sprout soup to your taste. Serve with the jjolmyeon. Posted on Wednesday, May 24th, 2017 at 12:52 pm. Posted February 11th, 2019 at 6:48 am | Log in to reply. 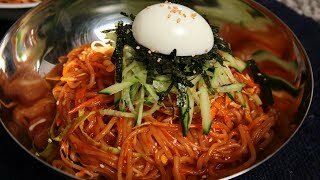 Hi Maangchi, I am interested to make a noodle recipe but cannot decide between the jjolmyeon and the bibimguksu May I know what are the differences in the flavour profile please? Posted June 21st, 2018 at 12:05 am | Log in to reply. I just had this for dinner with my partner. I made the red pepper paste myself as I have celiac disease and malt is a huge no-no. I found a recipe for “instant” gochujang made with fermented soybean paste and sugar instead of malt. Although I have no way of telling how close it is to the real thing, the final result with this recipe was extremely good so very I’m glad! Posted June 28th, 2018 at 7:39 am | Log in to reply. “malt is a huge no-no” lol your expression is so funny! Posted January 17th, 2018 at 10:10 pm | Log in to reply. This turned out great with red lentil noodles! It was my first time cooking lentil noodles, and I was so surprised that they were almost as chewy as 쫄면! I only had julienned red bell pepper and 콩나물 to mix in, but it was still tasty! Posted October 26th, 2017 at 9:47 pm | Log in to reply. Posted June 28th, 2018 at 7:43 am | Log in to reply. I know this is very late, but I’m seeing your photo just now. It looks great! Posted July 25th, 2018 at 8:57 am | Log in to reply. Thank you so much for taking the time to reply to my photo! Posted October 13th, 2017 at 1:09 am | Log in to reply. 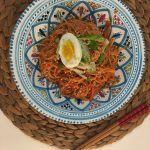 I made jjolmyeon on a hot August day and everyone enjoyed the cold but very spicy noodles. Posted July 8th, 2017 at 9:53 am | Log in to reply. the rice noodles I used (쌀소면) were chewy and perfect, too. Posted May 26th, 2017 at 2:48 pm | Log in to reply. It is very hot in here at the moment ! So for dinner we had jjolmyeon party :) Delicious ! Posted May 30th, 2017 at 2:37 pm | Log in to reply. The photo proves you were ready to mix all these in a few seconds! : ) Yes, it should be delicious! Posted May 24th, 2017 at 8:51 pm | Log in to reply. Hello Maangchi!! This recipe looks great, but I was wondering if I can make this ahead of time will it still be good? Will the noodles get soggy in 3-4 hours?? Posted August 22nd, 2017 at 8:41 pm | Log in to reply. I made a really large 24 oz jar of the sauce in June, and keep it in the refrigerator. It won’t go bad, since the gochujang and soy sauce both contain large amounts of salt. I’d suggest making the sauce ahead of time, and cooking/rinsing the noodles just before serving. The noodles will get too soggy if you cook them and/or mix in the sauce that far in advance! Also, if you have access to perilla leaves (ggaennip), chiffonade some and try adding that. Posted August 23rd, 2017 at 11:31 am | Log in to reply. What a great answer and a big help! Thank you! Posted April 16th, 2018 at 6:59 pm | Log in to reply. Would you mind sending how you made this batch of sauce? I’d REALLY appreciate it!! This recipe was originally posted on May 24, 2017 at 12:52 pm by Maangchi. The video was watched 1,314,154 times on YouTube & has 27,051 likes!